We did a new showcase example of the avatar display! It's more complex than the last one, but it shows some new features you might be interested in. This time it's mainly about how you interact with the interface; how to chat and how to launch other actions. You might notice that there are some differences in the way we are doing it to weblin and/or rocketon. Have fun playing with the showcase. The trickiest part might be the new radial menu. Our version is based on the atom interface. If you follow the link, you can read about the advantages a radial menu has. 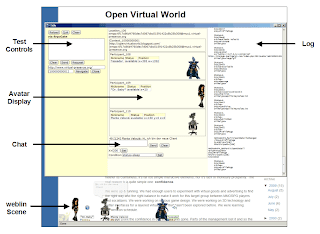 I am happy to announce that the 4th open virtual world meeting will take place this very thursday. Come join us.